For every "healthy" food, there is a claim to avoid it. What truly matters is for you to find your version of eating healthy. I love eggs for breakfast but sometimes I don't have time (aka don't feel like washing dishes) to make eggs. Then I discovered how easy it is to make eggs in the microwave. You just spray a small ramekin with olive oil, add one egg or 1/4 cup of egg whites with salt and pepper, cover with an inverted plate and heat for thirty seconds. If it's still runny, continue microwaving for 10-second intervals until it's cooked. The ramekin will be super hot so be careful but the egg comes right out. Sometimes I leave the yolk in tact and other times, I add cheese and scramble it up before putting in the microwave. These round patties are the ideal size for an English muffin. The best part is you can make them in advance. I put a slice of tomato and cheese with the egg on the English muffin and wrap them individually in press'n seal to keep in the fridge or freezer (just defrost the night before eating them). This way I can heat in the wrapping and take on the go or heat it up at work. Breakfast is the most important meal of the day and with thirty second healthy options, get cracking! I posted my top snacks months ago, my top desserts weeks ago and my lunch "workshops" recently. Now I'm pleased to share my go-to breakfasts. It's important to me to find meals I really enjoy that I know react well with my blood sugar yet I don't want to eat the same thing every single day. I figured out three breakfast options that have a great effect on my blood sugars and since there are three, I don't get bored. Option 1: Bulgur wheat with fruit - I used to eat steel cut oatmeal made in the crockpot with apples or peaches but sometimes I would have a blood sugar spike. I discovered bulgur wheat this year and it's an amazing product because it tastes great and due to the protein it has less of an impact on my blood sugar. It only takes about 10 minutes to make four servings, which can be reheated in the microwave. I added berries in the Spring/Summer and have started to use apples for the Fall. It can be made with water or milk and either way, it's filling. Option 2: Sausage English Muffin - If you view my Product page, you can see I love Ezekiel products and use the sprouted English muffins frequently. I also make these amazing breakfast patties found on my recipe page. By adding a slice of tomato, I get a juicy, filling breakfast sandwich that has a nice balance of protein and carbohydrate. The best part is they can be made in advance and reheated in the microwave. Option 3: Poached egg and toast - I love poached eggs. Something about the perfectly cooked whites opening to the semi-cooked yolk spread on sprouted wheat toast. While they can't be made ahead, I save this option for the weekend, which makes it feel special. It's no secret. I like to plan my meals and love cooking. However, it's not always easy with my job to do this after work each day so I started to make certain meals a few at a time. Once I figured out which foods stay better, I started to do my own little salad workshops (see the before and after pictures). Let me tell you something you already know, I am brilliant. 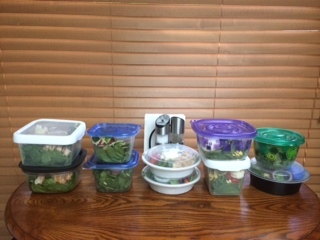 In less than an hour, my husband and I have a different lunch salad for every day of the work week. It's fun and I get to be so creative making salads that last all week by following these simple steps. Make sure everything is dry. Have everything out before you begin. 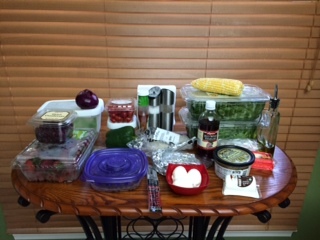 Pack anything with moisture (dressing, fruit, beans, etc.) in a separate cup. Do different salads for each day so you don't get bored. Eat salads with anything that might not last earlier in the week (e.g. chicken). You can do so many different salads from Asian, Fruity, Chopped, Southwest, Caesar, etc. using a variety of greens for the base, proteins, veggies and dressings. I typically pick 1-2 greens as my base and buy two large containers to make 10 salads. I might make or buy a certain dressing like Caesar but then use oil and vinegar for others so I don't have a ton of open salad dressings in my fridge. Several weeks ago, I wrote a blog entry about my top 20 snacks. I didn't realize how many options I had until I wrote the list out myself. Now I decided to do the same with desserts. I believe dessert can fit into any plan. Whether it's portion control, allergies or health concerns, you just have to be creative. 10. 1/4 cup part-skim ricotta mixed with a few drops vanilla stevia and fresh fruit. The fruit and chocolate options are self-explanatory. Recipes for the cookies and ice cream can be found here. 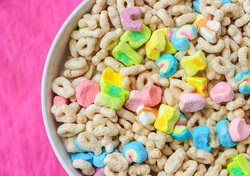 Cereal is Healthy for Breakfast…Right or Wrong? The answer actually depends on the person and the cereal. My tips are right below this short story. Although she works in the medical field, she knows very little about diabetes and starts asking questions because her mother has Type 2 Diabetes. Although the diseases aren’t the same, I’m always happy to discuss. “She used to eat sweets for breakfast but now she only eats cereal and still has poor readings,” she said with a completely confused expression. Then she asked me if my insulin pump would help with that. I explained that while the insulin pump is an extraordinary tool, it does not control your blood sugar. You do! While there could be many reasons for poor blood sugar readings, it got me thinking about how people believe foods always fit into two categories: healthy or unhealthy. While a ¾ cup serving of heart healthy whole grain cereal with skim milk works well for some people, few people will realize benefits from a giant bowl of frosted, fruity, cocoa anything. With most foods, you have to look at the labels.